It feels a little like I’m meeting a deadline just in time with this post. Although it’s been Fall in the retail world for about two months now, the rest of us still have two more days of summer to embrace which means enough time for me to share a poolside, cookout worthy recipe. Summer was pretty generous to us when you look at the big picture. Hailey danced in her first recital, we were lucky enough to get a dock at our local lake to park our boat for the season, I learned valuable lessons in my first year of gardening (that’s a nice way of saying my tiny garden wasn’t winning any awards this year, but I’m confident about round two), we ventured up to lake Erie to spoil our sweet niece who turned one, we took an amazing family vacation to Hatfield and McCoy in the mountains of West Virginia, I celebrated my 30th birthday in Disney World with my husband and new giraffe friends (we stayed at the beautiful Animal Kingdom Lodge), two weeks later we hosted a fun 14th birthday party for Hailey, we spent countless days enjoying the family farm, Allen and Hailey rode in their first Enduro races, we soaked up time with family in my hometown, I had my traditional day of canning at my grandparents’ house and Hailey had her very first day of high school. As quickly as time goes by, taking a moment to sit back and think about just how many wonderful experiences were had during a season isn’t common practice. It is however something I want to start doing at the end of each season to appreciate the time and blessings, close the chapter on that quarter of the year and fully embrace and look forward to the next season. Sometimes we forget to get out of the fast lane for a minute and skip over opportunities to be present and enjoy the here and now. So with two days left of summer yet, let’s stay in season and chat about a simple to make and delicious to eat Chickpea salad. Put that pumpkin spice latte down and pour another glass of lemonade. This salad is literally wash, chop, mix and toss. 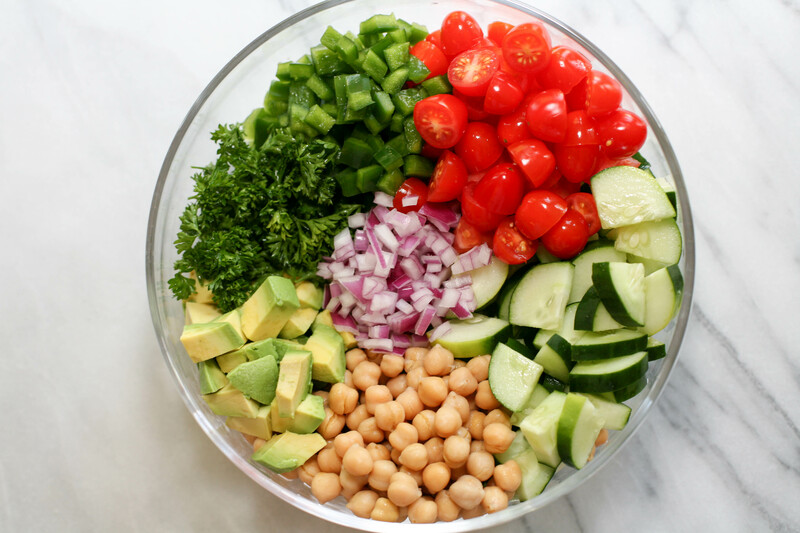 Wash your veggies/rinse the chickpeas, chop everything and add to a large bowl, mix the dressing ingredients and gently toss! 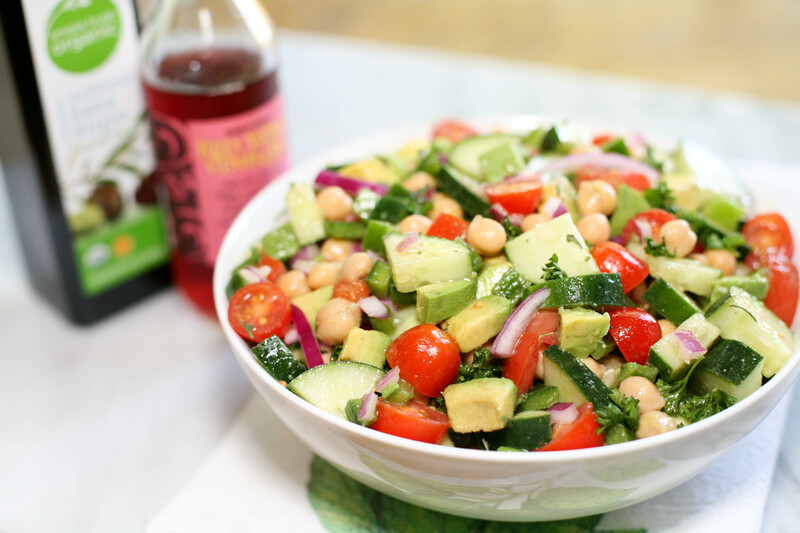 It’s best to make ahead of time, because the longer the salad marinates the better the flavor! 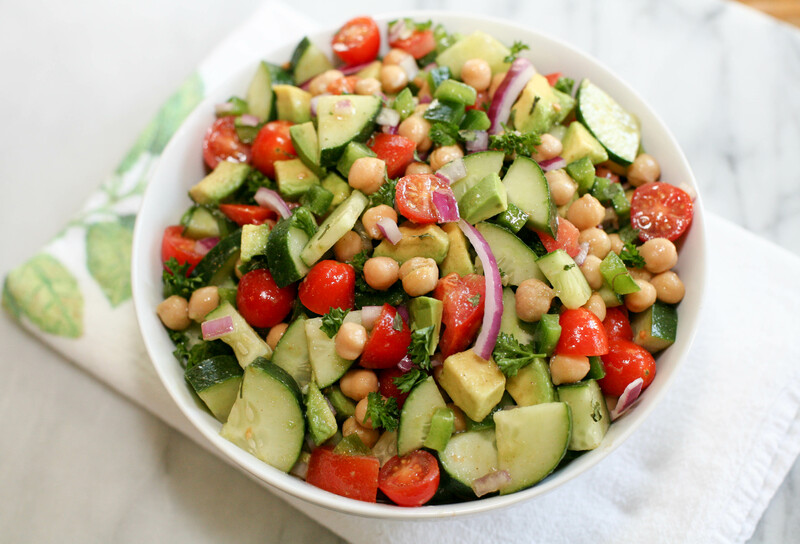 Fun fact…the dressing for this salad also works really well for tossed Mexican salads. I like to use it on salads filled with bell peppers, black beans, tomatoes, red onion, avocado (obviously) and tortilla strips. Yum! 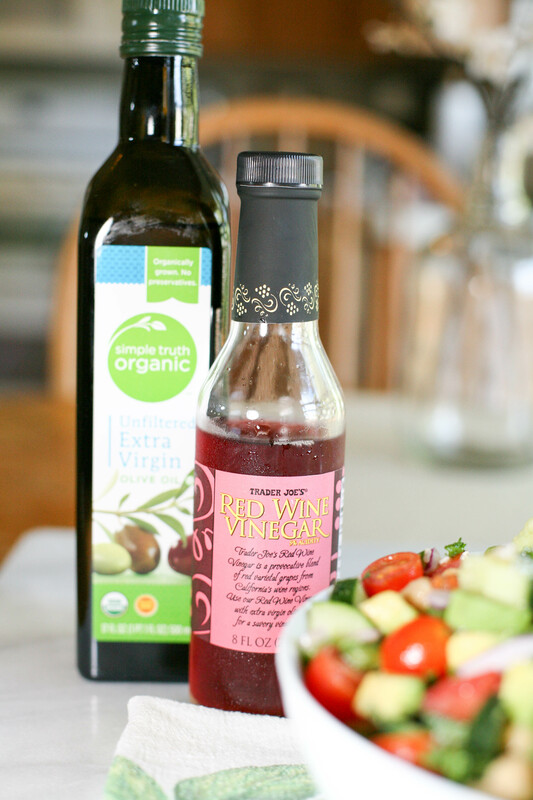 I’ve also found olive oil and red wine vinegar to be a good base for several dressings. You can use this combination with different seasoning pairings in multiple dishes. Bonus tip for this particular salad…add some strips of grilled chicken and a side of ciabatta bread to make it a meal! I hope you enjoy this salad, but more than that I hope you enjoy your last couple days of summer. Do something fun and spend time with your favorite people. And then go get your pumpkin spice latte on Friday and surround yourself with all things fall to feel the joy of a new season! 1/2 tsp Cumin – I like to make this a very generous 1/2 tsp!